My Life Monday's topic today is a picture and the story behind it. I know It is not Monday but at least I am participating in the fun! This picture was taken last summer. 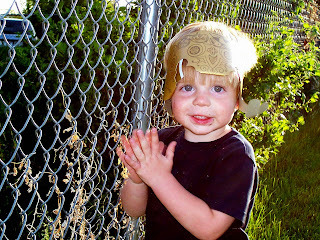 T took B to Burger King and he loved the crown he wore it everywhere for quite some time. He loved to wear it upside down. It looks a little like a helmet. Isn't he cute? On this one he apparently had no other place to sit. He loved to sit in any box or drawer he could find which meant that the things that normally belong in the box or drawer were all over the place! It was a very interesting stage. Look how cute he is! Those big, beautiful eyes are so stunning. I love the sitting in the kitchen drawer. They find the funnest places to sit! I love it! I love the drawer thing. 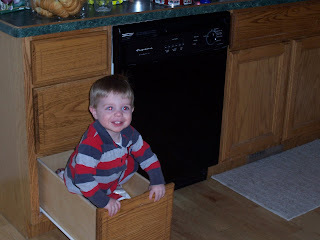 I have had drawer emptiers but no one that actually climbed in! Hey Shannon thanks for saying Hi it was good to hear from you, aren't boys the best?? I finally found your blog. It took me forever to spell it right. you better not be reading this in class!! Thanks for your comment. We are excited about our move! How are plans going for your move to Cache Valley? I hope everything is going well. It's GREAT to be a MOM!